Now, I can be a good example to others and change the situation of the children in our community. Magdalena Lòpez Sajic is a 28-year-old mother of four living in Villa Hortencia II. Last year, she was living in downtown Quiche when she decided to move back to this small community of 132 families. “I enjoy living here because I have a piece of land to plant; it’s like paradise,” Magdalena says with a smile. There are many reasons why she came back to Villa Hortencia II, but since her return, she decided to help as many families as she could. 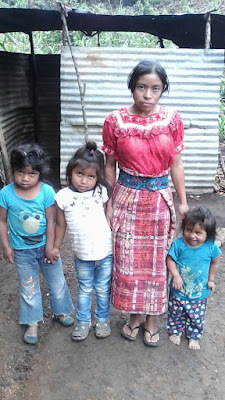 Magdalena’s desire is to help her community by contributing to the appropriate growth of the children. This is why she is part of the Growth Promotion and Monitoring team in Villa Hortencia II. During the short time that Magdalena has been in the community, her leadership and desire to contribute has had a powerful effect on those around her. Her desire will inspire more people in a positive way. With your help, Magdalena’s dreams of seeing children grow up healthy and strong according to God’s plan will come true. A MEMBER OF VILLA HORTENCIA II'S GROWTH AND MONITORING TEAM TAKES MEASUREMENTS. THE COMMUNITY OF VILLAGE HORTENCIA II IS NESTLED IN A SMALL MOUNTAINOUS VALLEY. THERE IS ONLY ONE DIRT ROAD IN AND OUT OF THE VILLAGE TO THE NEAREST CITY OF QUICHE.